Nω-nitro-l-arginine (NG-nitro-l-arginine) is a potent nitric oxide synthase inhibitor which crosses the blood brain barrier and does not undergo extensive metabolism in vivo. In this study, effect of chronic pretreatment of Nω-nitro-l-arginine (75 mg/kg, i.p., twice daily for 7 days) on the harmaline- (100 mg/kg, s.c.), picrotoxin- (4 mg/kg, s.c.), pentylenetetrazole- (50 mg/kg, i.p. ), andl-glutamic acid- (400 μg/10 μl/mouse, i.c.v.) induced increase in cerebellar cGMP was assessed. All the four drugs produced significant increase in cerebellar cGMP in vehicle pretreated control animals. Cerebellar cGMP increase induced by harmaline, picrotoxin, andl-glutamic acid was attentuated in Nω-nitro-l-arginine pretreated animals. These results indicate that in vivo cerebellar cGMP levels are increased by the prototype excitatory amino acid receptor agonist,l-glutamic acid and also by the drugs which augment the excitatory amino acid transmission. 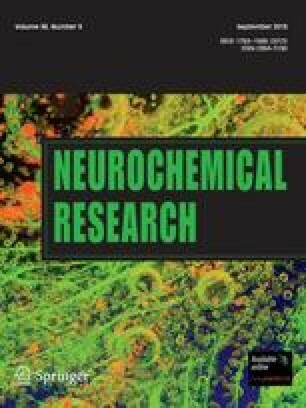 Furthermore, parenteral chronic administration of Nω-nitro-l-arginine blocks NO synthase in the brain and hence cerebellar cGMP response in chronic Nω-nitro-l-arginine treated animals could be used as a tool to assess the physiological functions of nitric oxide in vivo. Part of this work was presented at the “Experimental Biology 93” FASEB Meeting at New Orleans, March 1993.